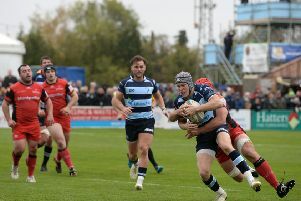 Bedford Blues have revealed that all-time leading point scorer James Pritchard will be leaving the club at the end of the season to take up a player/coach role with National One side Coventry. Pritchard, 36, or Skippy as he is known, celebrated his testimonial with the club last season and has been a key figure at Goldington Road for more than a decade. Originally from Parkes in Australia, Pritchard started his sporting career in Rugby League before switching codes, and continents, to join Bedford Blues in 2001. After a mini tour around the UK and France with Plymouth Albion, Northampton Saints and Perpignon, Pritch returned to Bedford in 2006 and made the town his home. Pritchard’s successes on the field are clear for all to see and, during the 2014/15 season, he overtook Andy Finnie as the Blues all-time leading point scorer. This achievement was coupled with the international equivalent when he surpassed Gareth Rees’s record of 491 to become Canada’s leading point scorer and in 2015 he took part in his fourth Rugby World Cup. Paying tribute to Pritchard, Blues director of rugby Mike Rayer said: “Pritch has been immense for Bedford Blues throughout his career and will be remembered as a club legend at Goldington Road for many years to come. Skippy won’t be alone when he arrives at the Butts Lane Arena as he will be joined by former Blue, and former housemate, Brendan Burke in a new look coaching team which also comprises of Boris Stankovich, Brendon Snyman, and director of rugby Rowland Winter.